In the Trout fisherman’s calendar , August is always a tough month! The Trout at this time of year disappear into the depths to find the sanctuary of cooler water. Presentation with fly and spinner is difficult when the fish are residing 20 feet below the surface, however worm can be held in this zone all day long and this interesting fact has been reflected in the catch returns of late! 11 year old Tom Pearson from Surrey was on holiday and went out on the boats with his dad Peter for the day. They both fished worm in the deeps and landed 4 nice Brown Trout to just under 2lb. Scott Carter from Lancaster also fished deep with worm and recorded 5 Trout to 2lb+. Also Dave Carter from the West Midlands took 4 nice fish , including a nice over wintered fish of 3lb on similar tactics. Anthony Jones from Glamorgan fished fly on a very fast sinking line from the boats and managed a nice brace of brownie’s to 2lb! Also Frank Armstrong had a great result on similar tactics recording 3 nice fish to 1lb 8oz , again from the boats! Spinner has accounted for the odd fish lately, but early mornings and evenings have been best for fishing up in the water! Indeed Dave Linton from Hull fished an early session from the far bank, opposite the ticket office and landed a nice brace of Trout, one tipped the scales at 3lb 11oz! As far as the Trout fishing is concerned though, roll on September, we need some good spell’s of wind and rain to get the fish up on the surface again. Anyway September is nearly here, so expect sport to improve no end! 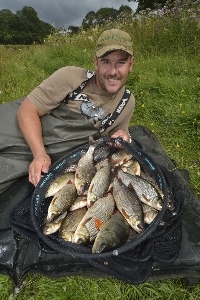 The Coarse fishing has been on fire recently with many bags reported in the 40-50lb region of mixed, Roach, Rudd, Bream , Perch and some cracking hybrids! Long range feeder tactics reign supreme, however 3 lads fished the car park peg last week with pole and recorded over 100lb of fish on float and maggot combo, between them! They had Roach to 2lb, Perch to 2lb, hybrids to 3lb 9oz and Bream to 5lb+. Don’t forget we are open year round now for general Coarse fishing and day tickets are only £10! Also Carl Hunter and his mate from Barrow fished the boathouse stretch last week and recorded over 50lb to Carl and his mate had 69 individual fish in a single session. They took Roach to 1lb 4oz, Perch to 1lb 4oz and hybrids to 3lb 8oz! To find out more on the fishing, please follow us on Facebook ,Twitter and Google+. Or you can contact Dave Coleman, fishery manager on 015394 36541.